Before the iPhone, before Twitter and before a Tesla had rolled off the assembly line, one couple set sail — and they’re still out there. Thirteen years. 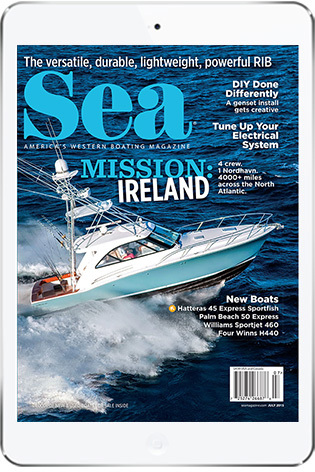 That’s how long Linda Edeiken and Chuck Houlihan have been cruising the Pacific Ocean aboard Jacaranda, a near-40-foot Allied 39 sailboat they call home. From the Sea of Cortez to Central and South America to the Galapagos Islands to French Polynesia, the pair have enjoyed all that the sea and exotic foreign lands have to offer since they departed from their San Diego homeport in 2005. We conducted an email interview with the couple, which we share with you. To get a better feel for the places they’ve been and the things they’ve seen, be sure to check out JacarandaJourney.com, which includes Passage Notes, photo galleries, trip reports and more. What convinced you to cast off the lines and head to the open ocean? 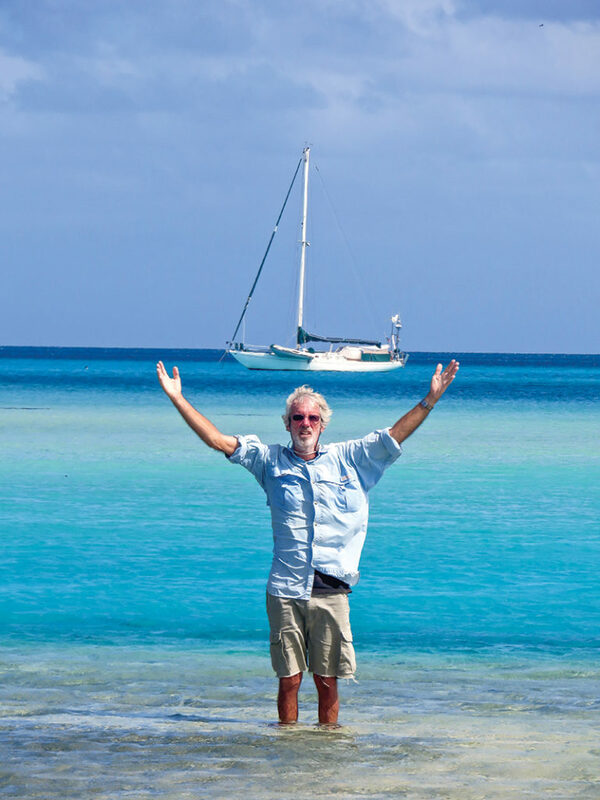 This journey has combined our love of sailing and love of travel, so it was an easy decision to head to the open ocean given Chuck’s 30-plus years of cruising experience, which really had developed into his lifestyle. He had done many long offshore passages before in his years of sailing, and the South Pacific was one of our major goals. This was Linda’s first long passage and a big item on her bucket list. We really enjoy getting off the beaten path, and we target that in our destinations — cruising as well as associated land travel — as much as possible. Did you have a long-range plan, or were you going to make it up as you went? We knew we both wanted to eventually get to the South Pacific, since Chuck had sailed here several times in previous years, with his sister and brother-in-law in the 1970s and again in the early 1990s on Jacaranda. He had also lived in this part of the world for several years earlier in his life. Chuck refers to this area as the creme de la creme of cruising and he always wanted to return. We actually had no goal other than that. A circumnavigation was not something we really cared about doing but thought we’d figure out our plans as we went along … which is what we are still doing, now that we’ve been in French Polynesia for three years. We have said we will continue to cruise until we either decide we don’t enjoy it anymore and want to do something else or we find it too physically challenging. What has your itinerary been since you left San Diego? Although we have both experienced sailing in other oceans and seas separately before we met, we have only cruised the Pacific Ocean on this current journey. After a shakedown summer in the Channel Islands, we left San Diego on Dec. 7, 2005, and headed to Mexico. We stayed in Mexico for seven years, splitting our time between Baja California and the Pacific mainland — spending the hurricane season in the Sea of Cortez and then crossing to the mainland between Mazatlan and Zihuatanejo during cruising season. 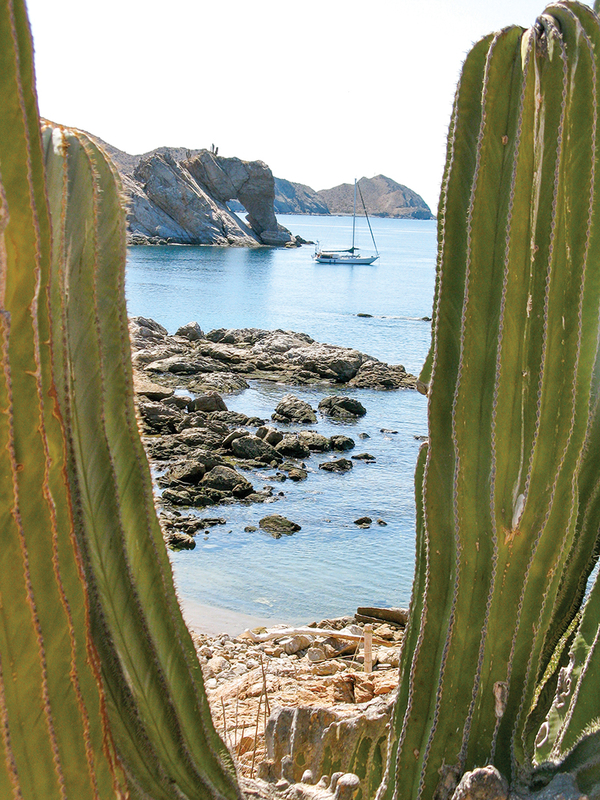 In the Sea of Cortez, quiet anchorages were one of the reasons Chuck and Linda spent seven years cruising Mexico. In 2012 we left Puerto Vallarta, Mexico, and harbor-hopped south along the Mexican coast to Central America — El Salvador, Nicaragua, Costa Rica — and then down to Bahia de Caraquez in Ecuador. 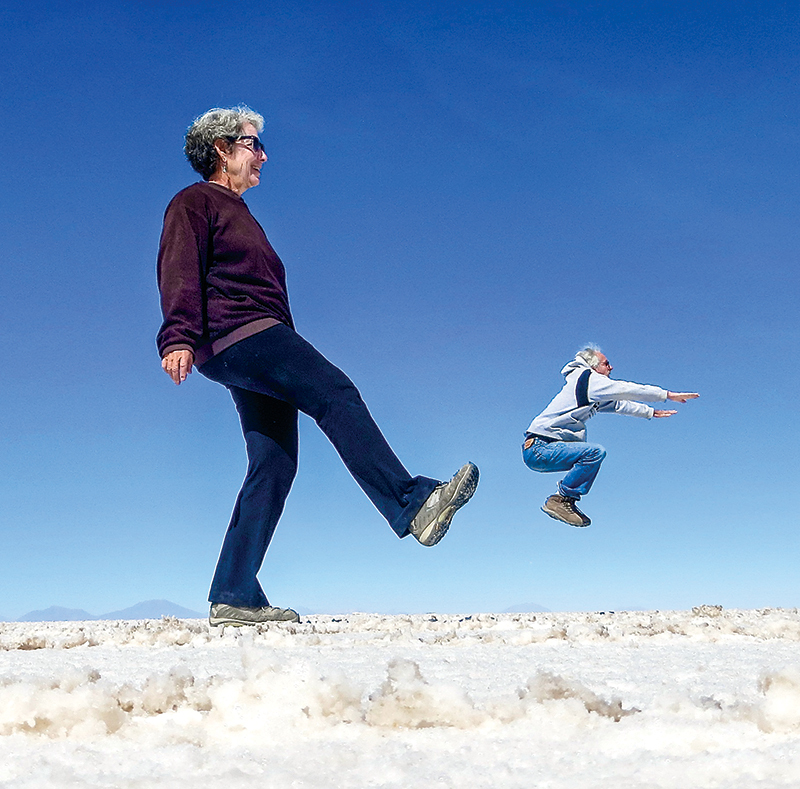 We did much inland travel and fell in love with South America, so we delayed our Puddle Jump to see more. We sailed back up to cruise Panama and returned to Ecuador to visit more of South America by land. In May 2015 we departed Bahia de Caraquez in Ecuador and sailed to the Galapagos. After five weeks, which is a little longer than Charles Darwin spent here on Beagle, in these magical islands, we left for French Polynesia. Our Puddle Jump took us three weeks, and we made landfall in the Marquesas in June 2015. We have remained in French Polynesia for three years now and taken our time to really get to know this wonderful country: one whole year in the Marquesas (it has six inhabited islands), six months in the Tuamotus (visiting seven atolls out of 77), and a year and a half in the Society Islands. Noisy neighbors were rarely a problem in quiet anchorages in the Sea of Cortez. We just made a decision to stay another year — since the boat can only stay for three years in French Polynesia, we will sail to the Cook Islands in June and return to French Polynesia, which will reset the clock for another three years — and plan to visit more Tuamotu atolls and go to the Gambiers archipelago. You mention getting off the beaten path whenever possible. What are a couple of discoveries you’ve made using that strategy that you might have otherwise missed? When Jacaranda was moored in Ecuador, we made many land excursions. Caño Cristales is a natural wonder in a remote area of Colombia also known as the River of Five Colors and The Liquid Rainbow. At the time (2014), the area was in the heart of a FARC red zone, a little-secured military oasis surrounded by dangerous guerrilla activity. There was no safe overland access, so we had to fly in. 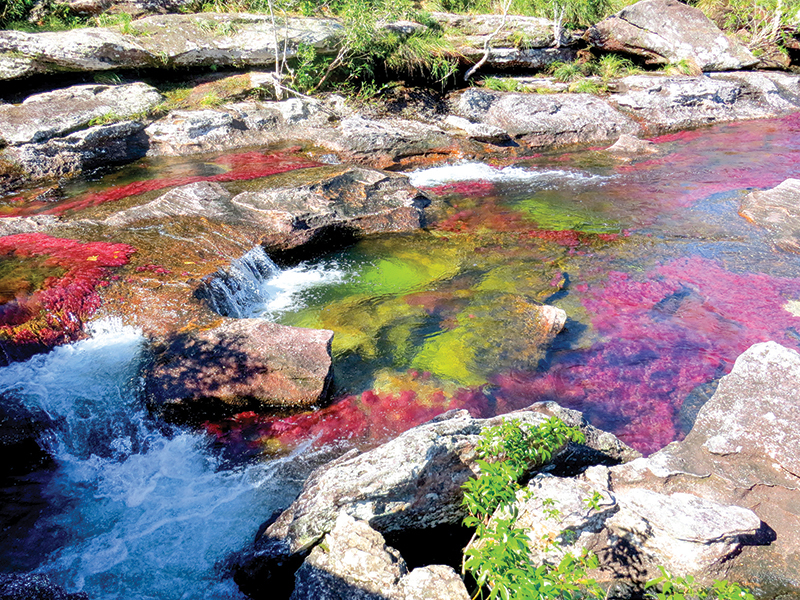 In Colombia, the Cano Cristales — the Liquid Rainbow — was a visual experience worth the journey. 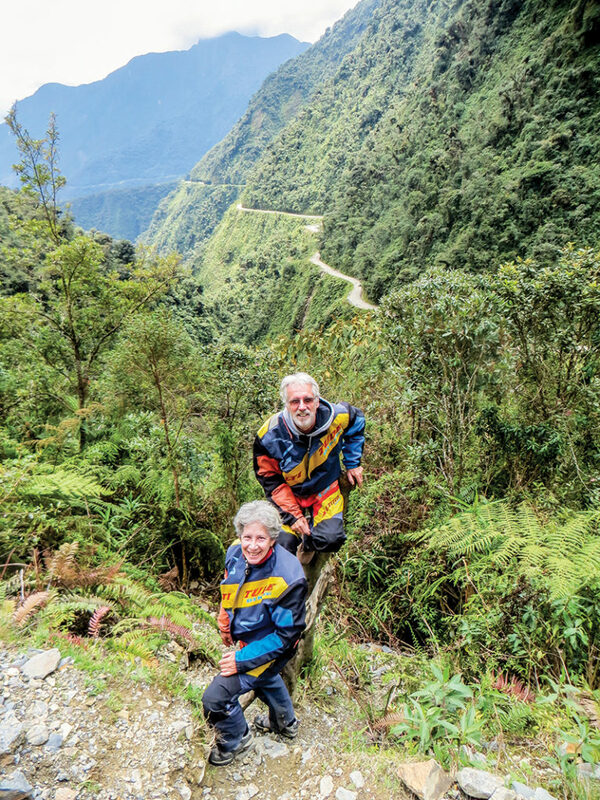 Chuck and Linda took a bicycle tour of Boliva’s Death Road, a barely passable 40-mile stretch of road that has claimed dozens of lives through the years, and survived to tell the tale. The most beautiful place in the world (so far) is ________. That’s a difficult question — kinda like having to choose between your kids! And so many categories of beauty. In terms of the most beautiful cruising grounds we have been to, French Polynesia or the Sea of Cortez in Mexico. The tropical beauty of French Polynesia and the diversity of its five archipelagos is stellar: the Marquesas’ lush, high, green volcanic mountains filled with tall waterfalls contrast with the Tuamotus’ flat, low-lying, coconut palm atolls whose lagoons are so blue it hurts the eyes. Polynesian culture, hospitality and generosity contribute to the attractiveness of this picture-postcard place. 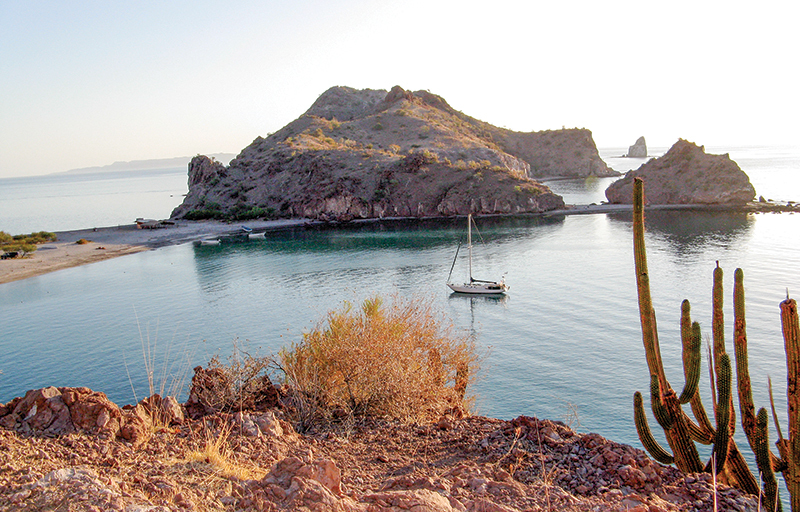 The Sea of Cortez, called “The World’s Aquarium” by Jacques Cousteau, is a spectacular landscape where the desert meets the sea. Its stark, dry, cactus-covered remoteness, coupled with amazing marine biodiversity, make it a standout — and it has some of the best sunsets and stargazing in the world. Can you tell us about a cultural moment/experience or two that have stuck with you? We love a good cultural festival, and highlights include Mama Negra in Ecuador, Heiva in Tahiti, Festival of Flowers in Medellin, Colombia, and the Tapati in Rapa Nui, but the most fantastic one would have to be the Matava’a in the Marquesas. (Passage Note #84) Four days of traditional dancing, music, chanting, drumming, tattooing, demonstrations, artisan fairs, eating and socializing were not a show but a serious cultural revitalization to recover a people’s lost identity nearly obliterated by colonization. It happens every four years, and we were lucky to have arrived in time to see the 10th Marquesan Festival of the Arts on Hiva Oa. 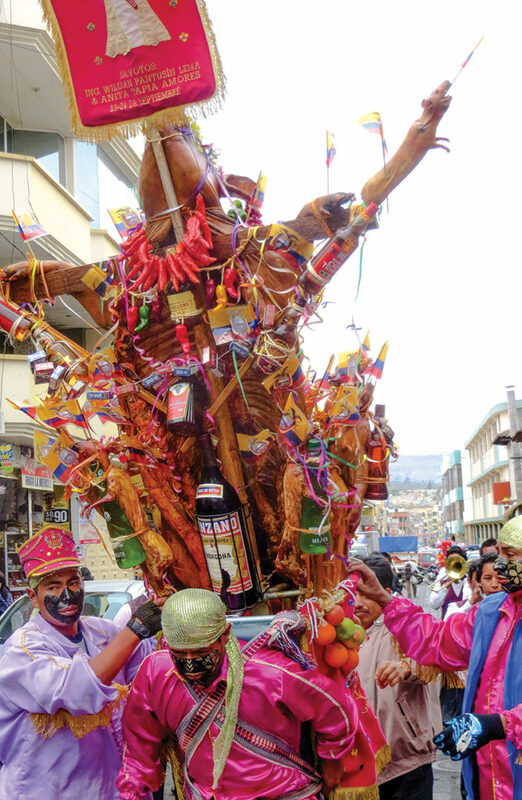 The Mama Negra Festival in Ecuador is a mix of Catholic, pre-Columbian and civic ritual. Here, a whole roast pig was splayed open, decorated with liquor bottles, cigarettes, flags and more, and carried on a man’s back. You’ve been away from life’s modern conveniences for several years now. Can you give us a list of the four or five conveniences you have missed and four or five you haven’t missed? • Heavy traffic. On the other hand, we love “rush hour” here in French Polynesia as the numerous va’a (outrigger canoes) glide past us early morning and at sunset. What boating lessons have you learned — or been reminded of or learned differently in a different setting? • Be as prepared as much as possible when you leave port. Try to anticipate the weather and set the boat up accordingly (both inside and out). • Reef early. It’s an old piece of advice for sailboaters that still applies. • Don’t defer maintenance. Prioritize what needs to be repaired and make routine inspections to get ahead of problems before they happen. The goal is to act on the offensive, not the defensive. Have you discovered anything about yourself that has surprised you? Living simply and with a small carbon footprint is very rewarding. We have discovered how little we need to live well and comfortably, how easy it is to be seduced by consumerism and the artificial demand created by Madison Avenue to need or want things we can easily get along without. together in such a limited — about 270 square feet — space 24/7. 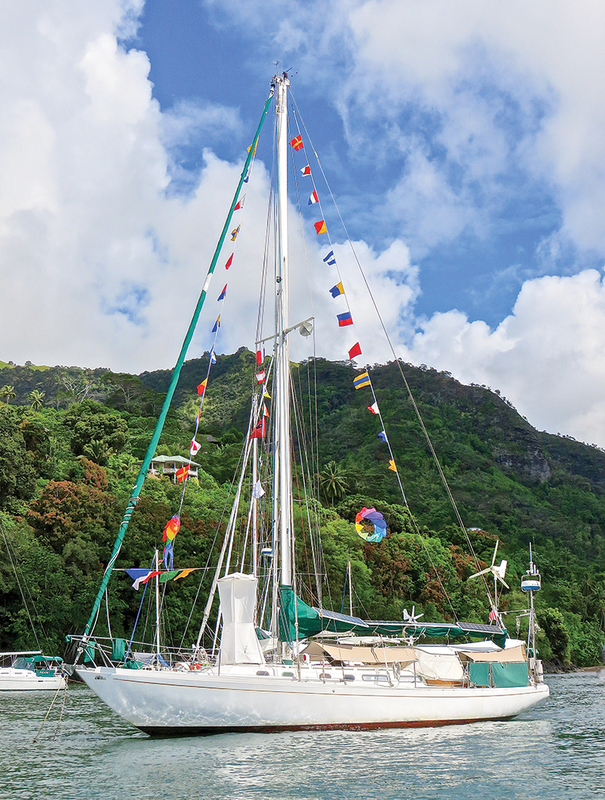 These days Jacaranda is one of the smaller cruising sailboats of the fleet. We are surprised by how difficult reentry is into life on land in the U.S. Every year we are away it becomes more difficult to adjust to life off the boat when we come back to the U.S. for a visit with the family. A word about courage. You don’t always know yourself well enough to predict your responses to hard situations until you find yourself in one. Every time you face a difficult situation, you learn about how you react and you raise the bar of courage for yourself for the next experience. Chuck has faced pretty heavy weather at sea in his years of sailing, so he has tested his own mettle at high levels, but Linda is still expanding her courage as she is exposed to it. The onboard items we’re most grateful for are ________. • AIS (with a transponder). AIS is a valuable passage tool that has made our watches safer and more comfortable and removes the challenge of having to rely on visual cues to figure out what direction and how fast a ship is moving in relation to our course. And we like that big ships can see us. Once, we were approaching the Panama Canal in high winds and rain with low visibility and were surrounded by thick freighter traffic; we could see the ships change course and steer around us on the AIS screen. • SSB radio. We consider this a primary safety issue. The Emergency (DSC) call reaches a wide audience. In addition, we are big supporters of the radio nets. 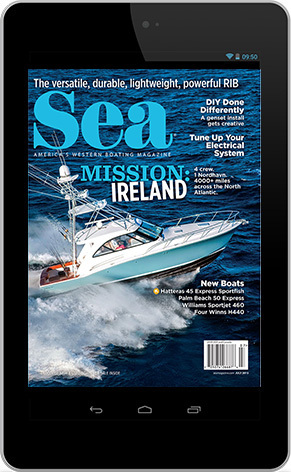 Some exist for support and safety during a passage; others are more social, allowing cruisers to share valuable information (e.g., thefts, changes in anchorages, advice about pass entrances) and just keep up with friends. 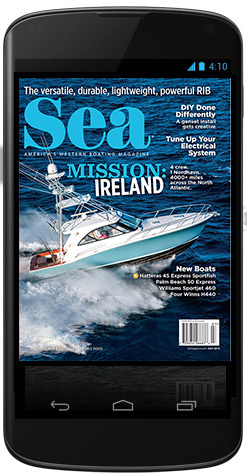 So many boats today are foregoing SSB radios for satellite communications, but we feel that is a mistake. • Fans. They are critical for comfort in the tropics. When we were not spending hours in the water, we lived under our fans during the summers we spent in the sweltering Sea of Cortez. We love our Caframo fans. • Water-maker. Having one has allowed us to go places that are farther afield, such as the Revillagigedos Islands (Mexico). We would have been unable to stay for weeks in this remote place without our own water supply. It is nice to not have to worry about locating a source of potable water and then have to physically lug cumbersome and heavy jugs of water to the boat. We rely heavily on our rain catchment system when we can. Clean, fresh water should be recognized as a necessity of life, not something to be taken for granted. This is something you realize if you do enough traveling around the world, especially away from developed countries. • Electric windlass. With one, it is easy to anchor and re-anchor and re-anchor until we are satisfied. It also makes anchoring in deep water easier. • Wind vane. Having this steering device is like having another crew member that we don’t have to feed. It steers using no power and doesn’t complain about working 24 hours a day. 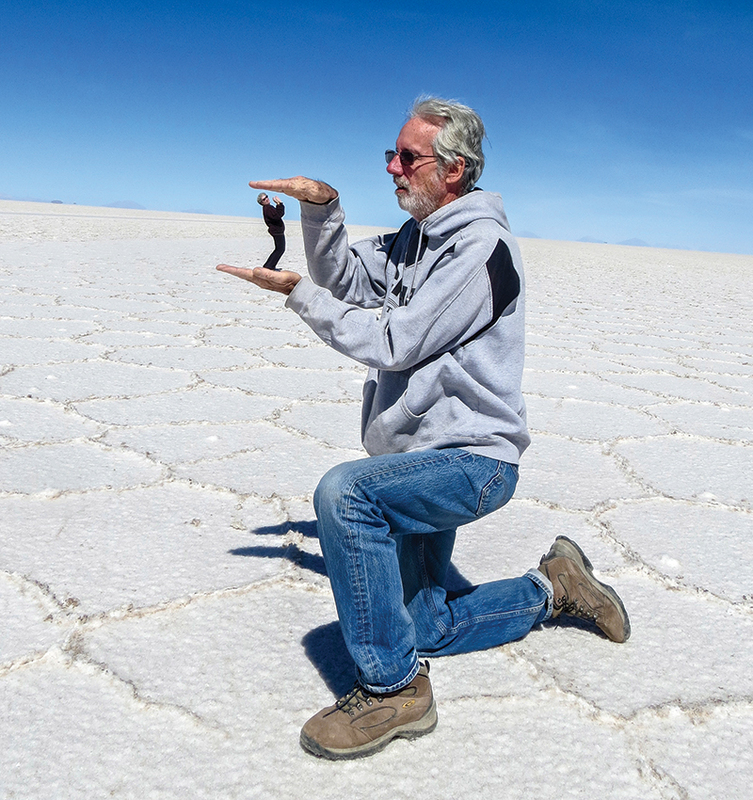 In Bolivia’s salt flats, the sailing couple found time for some optical hijinks. If I limited you to 160 characters, like a text message, what would be your message to other boat owners dreaming about shoving off? Go now. Don’t wait. Go while you have your health. Life is short. What a great story. But I’m sure you’ve heard that before. You two are pioneers in the earth’s beautiful environment.Wow! What a life! Thank you for sharing your beautiful journey. Outstanding! Loved your article and photos! Keep on sailin’ and enjoyin’ it all! What a wonderful “can do” attitude!